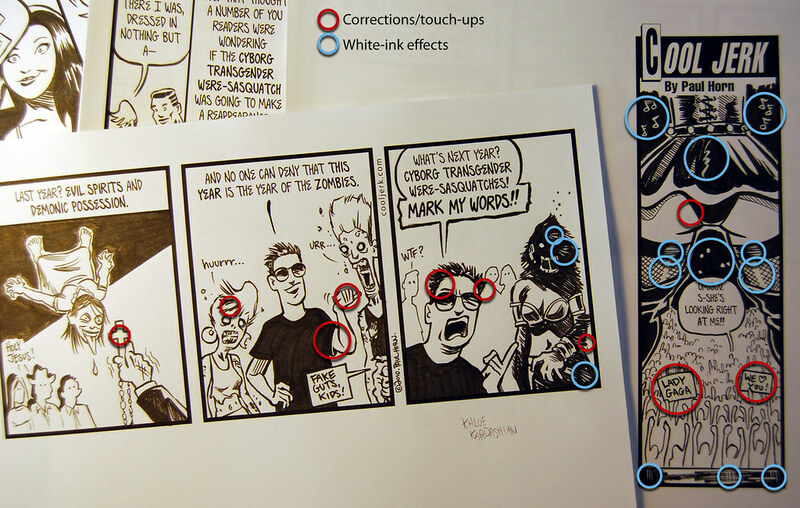 Inking Cool Jerk is a two-step process — black ink and white ink. It’s true, people. I make mistakes. Sometimes a line goes wrong, sometimes the brush is flawed, sometimes I need to edit out part of a drawing, sometimes I need to break through a panel border, and sometimes I need to overhaul a drawing from scratch. Also, white ink can be used for effects, especially when you want to add white lines to a black object. That’s when I turn to my correction ink of choice: Pelikan Graphic White. Like, For Shore! original circa Oct. 1987. I angled the light source to hilight the Liquid Paper relief map. 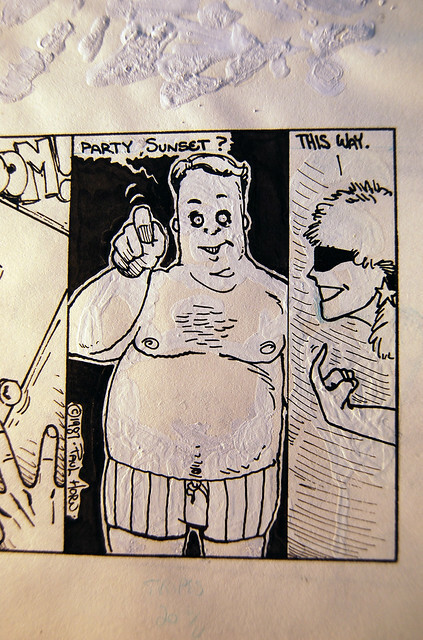 Well, I knew the pros at Marvel and DC Comics — as well as syndicated cartoonists — had to use something else. Somewhere I heard about Pelikan Graphic White. I looked for it in Reno and couldn’t find it anywhere, so I ended up buying a jar from Taylor’s art supply store in Sacramento (long-since gone). That was 1988, and I’ve been brand-loyal ever since. What makes Pelikan Graphic White so good? Well, let me start by saying MY experiences are unique to MY cartooning process, and Pelikan may not work for everyone. In fact, veteran comics inker Klaus Janson says it’s the worst correction ink on the market, and he swears by another brand. (Click it for detail) Cool Jerk circa 2010. Pelikan keeps the originals nice and tidy! You’d think that being water-soluble, Pelikan Graphic White would mix with the black ink beneath it, making it a gray mess. Nope… so long as you let the ink dry first. 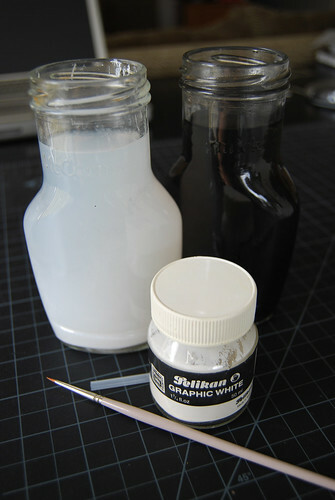 And to keep your gouache pristine white, ALWAYS use a dedicated white-ink brush AND dedicated white-ink water jar. Cross-contamination is dangerous in cooking AND cartooning! 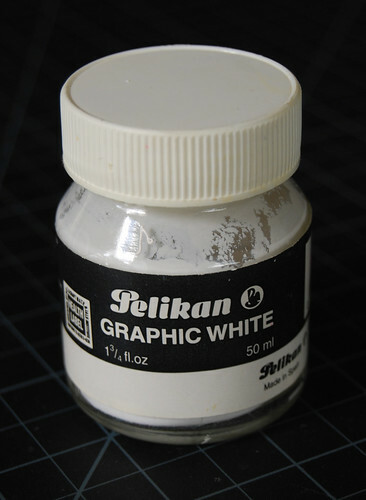 One of the best aspects of Pelikan Graphic White is that a jar will last forever. That pea-sized dollop on your palette will dry out in a few minutes, but all you need is a couple drops of water to reactivate it. For me, that dollop might last 6-8 months before I need to get another small scoop from the jar. Pelikan Graphic White isn’t without a weakness, however: it has problems covering up laser printer toner (the toner tries to repel the gouache because of its water content, so it sometimes takes 3-4 coats). So if I know I’m going to break a panel with a word balloon, I try to take care of that on the Macintosh. 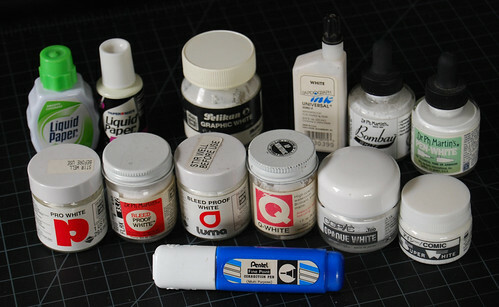 I’ve amassed something of a white-out museum over the years, collecting and trying many varieties of inks and gouaches. Some have many of the same properties as Pelikan, but fail the re-inking or eraser tests. I just took a look in my Pelikan Graphic White jar and it’s all dried up. No worries— all I need to do is slice out a chunk, put it on the palette, add some water and I’ll be good til 2012.